Ms. Friedlander began her career at Christie’s in 2006 in the Post-War and Contemporary Department, where her first project was working on the installation of 150 live pigeons sold as part of an installation by Kadar Attia in the Pierre Huber sale. Since joining, she has led and contributed to some of Christie’s most important auctions and consignments. 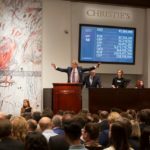 As the head of the New York Evening Sale, Ms. Friedlander has overseen six of Christie’s most successful auctions, including the highest grossing sale of all time. Since 2009, Ms. Friedlander has also donated her time as a charity auctioneer for a diverse array of leading non-profits throughout the Americas. Ms. Friedlander graduated from Brandeis University with a B.A. in Art History, and minors in Creative Writing and Women’s Studies. She went on to complete her Master’s degree in Fine and Decorative Arts at the Sotheby’s Institute in London where she wrote her dissertation on late 19th and early 20th century American and British periodical illustration.